"We deeply regret" this decision, Navarro said at a Tuesday press conference, because "it will create even more confusion for foreign investments, which help job creation and prosperity in Cuba." The EU is Cuba's largest trading partner. A senior Trump administration official told Reuters earlier Tuesday that the US was poised to announce new punitive measures against Cuba, Venezuela and Nicaragua, permitting lawsuits to be filed in US courts against foreign companies that have benefited from Cuba's seizure of American companies after the island's 1959 revolution. The move is set to be introduced under the 1996 Helms-Burton Act, which gave Washington the right to sue companies profiting from properties that Cuba confiscated, Sputnik noted earlier. 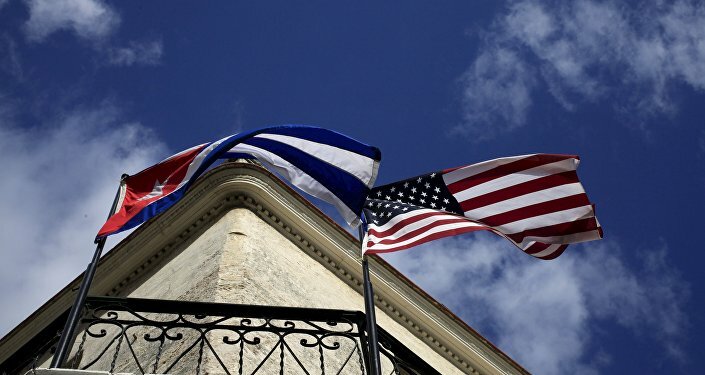 However, every US president since Bill Clinton has postponed the key clause because of fears it could hinder relations with Cuba and alienate America's allies. The move continues a trend set by US President Donald Trump since he took office in January 2017 of reversing the rapprochement between the two countries begun under his predecessor, Barack Obama. The Trump administration has also in recent weeks accused Havana of controlling nearby Venezuela, where Washington is trying to orchestrate a coup d'etat against elected Venezuelan President Nicolas Maduro, with US Secretary of State Mike Pompeo posturing that US actions in the country and against Maduro's government are being undertaken in the interests of protecting Venezuela's sovereignty from foreign meddling.